The Rapier was a move by Lagonda into the market for high-quality small cars, and for the first two years of its life it was a model of Lagona and made in the same factory as the larger cars. Designed by Timothy Ashcroft, it had a completely new 1104cc 4-cylinder engine with chain driven twin-ohcs and hemispherical combustion chambers, twin SU carburettors, 4-speed ENV pre-selector gearbox and a top speed of 75mph with a 4-seater body. In 1935 Lagonda went into receivership and was bought by Alan Good who formed a new company, Lagonda Motors (Staines) Ltd. 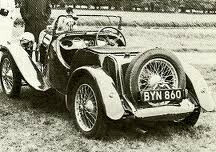 He discontinued the Rapier, but Ashcroft, aided by Bill Oates who had raced Lagondas before World War I, and financier Neville Brocklebank, bought the stock of Rapier parts and set up Rapier Cars Ltd in the old Lagonda sales depot at 196 Hammersmith Road. The Rapier was offered with a supercharger in 1936, and was made up to the end of 1937. The company was wound up in 1938 and finally dissolved in 1943, though Ashcroft had hopes of reviving it after the war. A few Rapiers were built up by enthusiasts from prewar parts up to about 1950. Lagonda had ordered 500 sets of components when they launched the Rapier; 470 had been used up by 1939.